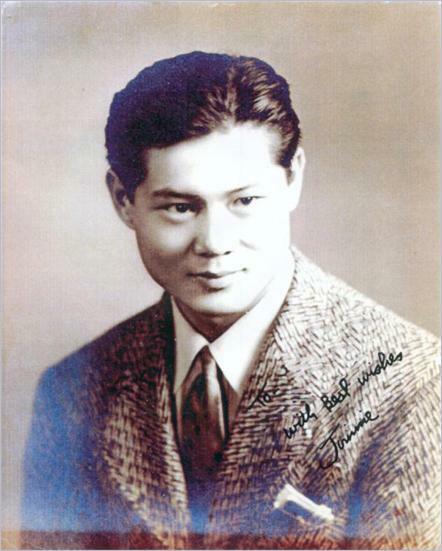 James Lee was born on January 31,1920 in Oakland, California. During high school, he practiced much weight training, bodybuilding, hand balancing, and acrobatics. In 1938-9, Lee was on the Oakland YMCA weightlifting team and won the Northern California Championship in the 132 pound division. Although he had an avid talent for drawing and art, James began a career in welding and worked in the Pearl Harbor shipyards in Hawaii as a civilian. While in Hawaii, Lee began studying Judo at the Okazaki Gym with Bill Montero and Sydney Yim and also competed in a few amateur boxing matches. He continued to regain his strength and picked up his martial arts training when he studied Sil Lum Gung Fu under T.Y. Wong in San Francisco for four years. James became known for his iron hand/palm training and would routinely perform his specialty at public demonstrations: breaking ten bricks with his bare hands（which were not scarred or calloused, but soft and smooth）. In 1957-8, he authored, published, and distributed（by mail order through his own company, Oriental Book Sales）a book series "Modern Kung-Fu Karate: Iron, Poison Hand Training." James first heard about Bruce Lee when Robert, James' older brother, told him about how Bruce was teaching a cha-cha class (while visiting from Seattle) and that he was good in Chinese Gung-Fu. Wally Jay and Allen Joe also informed James about Bruce's prowess as a fighter. In 1962, they met after one of Bruce's dance lessons and they hit it off immediately, meeting as often as they could to train and talk. In late 1962, James visited Bruce in Seattle for further training and seriously considered relocating permanently to study with Bruce. But due to other family obligations, James had to put that idea on hold. When James' wife, Katherine, died in 1964, Bruce and Linda Lee moved to Oakland to stay with James and his children. James helped Bruce Lee publish his first book, "Chinese Gung-Fu: The Philosophical Art of Self-Defense." They opened a school in Oakland but later moved it to James' garage since the school was not a commercial success. After Bruce moved to Los Angeles in 1966, James continued to teach in his garage. In 1972, James published his last book, "Wing Chun Kung Fu," with Bruce as the book's Technical Editor. James conducted four classes, during the evenings after work. There was a weekend class in which students came as far as eighty miles away. James was simple and direct with his students: no beating around the bush or attempts to woo them or seek visual/verbal gratitude from them. All he wanted was to train hard and often, try the best one could do without any explanation, and treat each other with due respect, behaving as gentlemen. He constantly told his students to pay attention since James disliked repeating himself when giving instructions. Students were on probation which meant that they could be released if they were a detriment to James or the class. He was a very patient teacher as long as the student put out their best effort. He neither watered down not diluted his teaching methods. Class ran smoothly and efficiently, deliberate and constant in both physical and mental energy. Students would occasionally be allowed to rest, but at the end, they knew they had been through a complete workout.